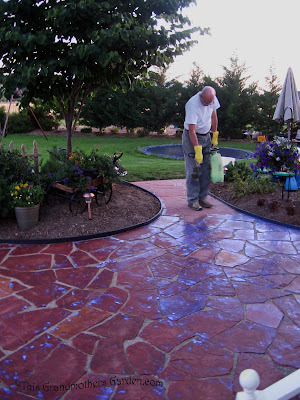 This is the last post in our series of how we built our Flagstone Patio. With the sand in place between the stones, our patio was looking beautiful. However, we wanted to keep the sand in the gaps and not have to worry about sand on top of the stones. We also wanted to insure our hard work would last through the extremes of heat and below freezing temps as well as wind and rain and snow. This sealant is a thermoplastic, all acrylic polymer which seals the stone, penetrates the jointing sand and binds the sand to the sides of the natural stone creating a stabilized surface. It is designed to be sprayed on to the sand in the joints between the stones, holding or locking the sand in place. We waited several days for the heat of the sun to completely dry the sand between stones. Not wanting to 'glue' any sand to the surface of the flagstones, we carefully swept any remaining sand from the face of EACH stone, back into the cracks. Then we used a shop vac to vacuum any remaining grains of sand from off the flagstone. This was a bit tedious, but not difficult. Next, using a pump sprayer, we sprayed the Stone Lock liberally to the sand in the cracks as well as on each stone. Initially the liquid looked like bluish milk, but dried clear. (I freaked out when I saw the blue, but my Honeyman assured me all would be well... and it was.) The patio was dry after 3 hours. Noticing that some of the joints were not quite hard, we applied a second coat to all joints. After waiting again for the Stone Lock to dry, our flagstone patio was finally complete. Next month will be the third anniversary of our patio. It has fulfilled all our expectations. We love the beauty it brings to our landscape. We haven't been disappointed in its performance at providing a beautiful, easy to maintain, walkable surface where our family can enjoy the paradise we have created. We worked together to create something beautiful, but more importantly, a choice opportunity to create family memories that bind our family together with love. Or family motto has become: We Do Hard Things. The Stone Lock was advertized to virtually eliminate weed and grass growth in the joints, which it did quite well during the first year. We now have a few weeds peaking out from the cracks but we have never re-applied the Stone Lock as was suggested. Perhaps we will do that this year. We have on occasion been asked why we didn't use mortar to fill the gaps. The answer is quite simple. We don't like the looks of mortar. It tends to crack as the extreme temperature changes we experience here cause the stones to shift. 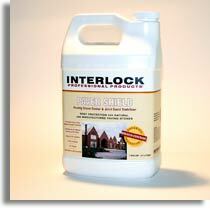 Sand, even with the application of Stone Lock, is flexible enough to eliminate the unsightly cracks. I would also like to note that my Honeyman is not a contractor or a builder, or anything of the sort. He is an engineer by trade and works at a computer. He has become, in the course of our almost 36 years together, The Builder of All My Dreams... if I can dream it, he figures out a way to build it. Wait till you see what we're working on now! A beautiful patio. They now have polymer sand available. It hardens when watered in so no weeds or cracks. Really? Now that sounds cool! Thanks for this information - I didn't know such products existed. These posts have been so fun! Has it really been three years already? The patio really is beautiful, I've seen it in person! Your patio is beautiful! I would love to have a patio like yours. Carolyn, the patio is gorgeous. I would be so proud to have one like it and the fact your family all worked together on it makes it even more special. I've never heard of the product before, this is something to keep in mind. I can't wait to see what you creative, hard-working people have coming up! Again, thanks for these posts, and for revealing this last secret! I anxiously await finding out what you're working on next! I wouldn't have used mortar either, it's easier to reset individual stones if they heave. I think your patio is beautiful! We installed a sand set cobble patio in our last garden, and wished we'd used the Interlock as was recommended, as it was a constant chore to sweep loose sand back into the joints. Did you find that it discolored your stone at all? We were concerned it would change the tone of the cobble. Of course, we sold the house, so now it's someone else's headache. Maybe they used it after all, but we're planning to install a similar cobble patio here, and might consider using it this time. Thank you all for your comments and yes, we LOVE this patio. The Inter Lock dried clear, thankfully not the blue tint, and there was no discoloration of the stones. It has held up beautifully in our extreme temp changes, no heaving what-so-ever. Setting the stones in sand was the right choice. As for our next project... oh we're having such fun! Should be done soon if the weather cooperates. That is just beautiful! I have also used Polymeric Sand from Lehi Block in the joints which is solid when dry but soft when wet. It also flexes with freeze/thaw cycles. Still, I am glad to know about the above product. Your updated reviews are most helpful. Carolyn, the layout and colors of your blog are so very appealing. Those happen to be some of my fav's. What a great patio, you all did a wonderful job, and it looks spectacular. This patio along with the home and garden will be well loved Carolyn. It looks so nice! Give your husband a big pat on the back. It's nice to hear of that product - I'll keep it filed away for when we redo our patio in a few years. You're making me think that it would look great in my backyard. We really don't have a full patio just walkway and blocks I put in 13 years ago. It turned out beautifully! Thanks for the tip on the stone lock. I like the idea of spraying it on and having the sand locked into place. It all looks fabulous. Wow. Your patio looks great. Nice job. I am inspired! I came from b-a-g's post about her project where she left a link to yours. Wow! I guessed from the first post that your Honeyman couldn't be just any contractor...you are so lucky to have your builder of dreams. Mine made me a pergola.Lovely to re-connect with you again. I am insipired! Not only for the transformation of my yard but I love the loving way you speek of your husband! Thank you for sharing your love that flows over into your amazing garden. Loved reading about the installation of your patio. I too, am married to an engineer whose day job at a computer pays for all the 'weekend' jobs around the yard! Interestingly enough, we also have a bark-mulched area where we have been planning to place a stone patio. In our case, we have waited 15 years so far... seeing your photos is inspiring. After weeding our 'bark mulch' for the umpteenth time yesterday, I was ready to consider a poured cement patio grooved to look like stone, perhaps the Stone Lock is the answer. Will have to show your posts to my Hubby!